I am Happy Prancy Dancing all over the place. A few moments ago, the UPS man delivered a huge box from the Targets that I was not expecting until next week. In it was my new comforter and shams that I paid ZERO dollars for. As in zip, zilch, nada. Zippo. Not one dollar at all! I am a pretty good bargain shopper, and I use the Targets for my non-grocery househod items like shampoo and cleaning things. I also use the pharmacy for several of my prescriptions. If you're careful and plan your stock-ups, you can often get $5 gift cards with the purchase of multiples of things. So I saved and saved and saved these $5 gift cards until I had eight of them, and then guess what happened last week? This set went on sale for $39.99! I put it in my cart so fast I thought my iPad thingie was going to catch on fire! 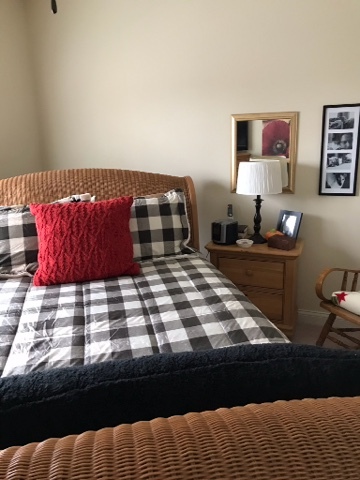 I did spend $19 of my pin money on the red pillow and black fuzzy body pillow cover, but shipping was free and I didn't have to carry it up the steps...so I splurged. Happy Saturday, Dearies! I'm back in the chair now and ready to stitch and then enjoy a very good and happy night's sleep! Your room looks so nice, and I love the Stewey collection on your bedside table. I remember some of those little orange pumpkins on the floor around CS1 when Stewey was still alive. 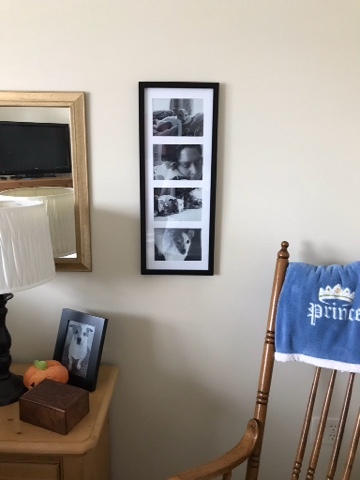 It made me smile to see it next to his very handsome framed photo. Have a lovely evening. A wonderful reason to break your vow of not moving today! Fabulous outcome for a fabulous price - well done that woman! It looks marvelous, Coni. Wishing you pleasant dreams under the new comfortable! Very nice. I Love that you were able to do free, free, free. so good on you. Love it! It looks great! Nothing beats a good Target shopping.